Sept. 6, 2018 | It has been three years since PrintSMART started at UAMS. 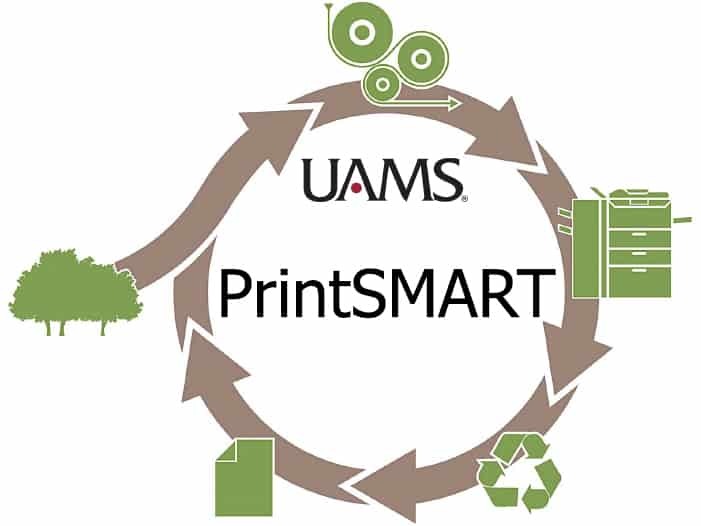 In those three years, UAMS has saved more than $3.25 million through the print optimization project. The ultimate goal is to save $6 million over five years, said Dave Ripa, assistant vice chancellor for finance and a PrintSMART project leader. Most of the savings have been realized by moving equipment leases and supply purchases (including toner and paper) to a single vendor. These two steps have saved $818,474 and $1.7 million, respectively, between June 2015 and July 2018. UAMS saved $70,000 in supply purchases in the month of July — a 61 percent drop from June 2015 levels. Many of the new printers are equipped with badge readers, which also have substantially reduced the number of unclaimed pages left on the printer. With the new badge readers, if someone sends a job to the printer and doesn’t swipe their badge to release it within 16 hours, that job is deleted. The third component of the process is building optimization, in which a PrintSMART team member meets with a department’s managers, determines their printing needs and then works with the department to allocate resources to meet those needs. More than $730,000 has been saved through this process from June 2015 to July 2018. Most of the campus has now been optimized, said Dawson. The remaining areas, which should be completed by the end of the year, are Ward Tower, the Emergency Department, Hospital B1-2, Radiation Oncology, the Walker Annex and the College of Medicine’s Department of Pediatrics at Arkansas Children’s Hospital. Various Regional Campus buildings also are due to be optimized.